A couple of weeks ago I was making the long trek back to Waco from Nashville by myself, so I had a lot of time to be alone with my thoughts. Driving alone is one of my favorite things — it tends to be a space with God I didn’t even realize I needed so badly until I get it. During that long drive alone with Him, I had a bit of a paradigm shift. Not really a new revelation, but one I definitely needed to be reminded of. I was reflecting on my time in Tennessee, thanking Him for all the people who still love me so well there, despite being gone for six years now. And I think the thing that marked that week, more than anything else, was just the nearness of God. Every moment felt so full of His presence. Whether I was catching up with friends, crying with them, laughing with them, dreaming with them; I just sensed His presence in every interaction. As I drove back home, I realized I’d been believing a lie that He had sent me on some pilgrimage by myself, when in reality, He’d been with me all along. This year has been a pilgrimage, indeed. I’ve felt a challenge from Him to faithfully move forward into new things — in my marriage, my ministry, my job, my family — all of it has been in process this year, on the way to newness of life. Notice I said “on the way” to newness. I’ve felt very much like I’ve been trekking through the wilderness to something He’d invited me into, but I haven’t ever really been sure of how/when/where I was we were going to arrive at the end of it. So I’m driving back from Nashville, literally on a journey with Him, and at the realization that He’d not sent me on a journey, but invited me on one, I just wept. As I took off I saw the sun rising on the other side of Charlotte, backlighting the skyline in such a way that no photo could do justice. And it felt right that I should be flying west, into the part of the earth the sun had yet to dawn upon. Awaiting the light and the clarity, but knowing that as sure as every single morning that brims with new mercy, it was certainly coming. How silly of me to forget that the journey is always about finding more of Him along the way. And it’s just like me — like all of us, I suppose — to find glimpses of His kindness and faithfulness like that, and then forget about it for months. And I don’t want to be forgetful anymore. Because like wildflowers that grow in the wilderness, He has planted seeds of hope along this road I’m traveling, and I don’t want to miss a single one. So I’m starting a new habit of capturing these Glory Glimpses in my day-to-day. It takes 28 days to form a habit, so for the next four weeks, I’m freezing moments in time that He reminds me of His presence. Will you join me? This is one of our greatest weapons, to take hold of His goodness as a light that shines straight into the darkness ahead. And how bright would we shine if we did this together?! I’ll update here weekly, but please follow — and JOIN! — daily on Instagram. 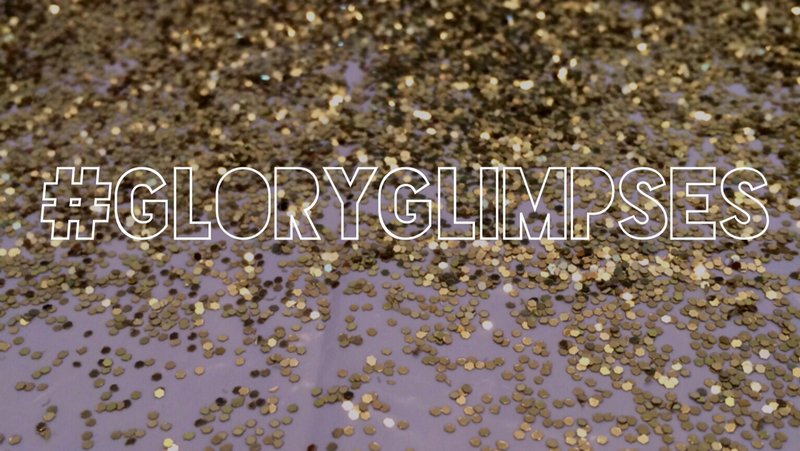 Simply capture those moments of His nearness and tag it: #GloryGlimpses. Let’s fight complacency, loneliness, bitterness, doubt (the list could go on…) together, and walk out of the wilderness with a bouquet of wildflower moments to show for the journey. I bet there’s beauty in that brokenness you’re walking through.